An effective SEO strategy is critical to standing out in a competitive market. Distinguish your company leveraging SEO to drive and increase qualified, steady traffic to your website. Search Engine Optimization (SEO) generates an increase in qualitative traffic to your website. Qualitative in that the traffic is specifically looking for your product/service, therefore, they are more motivated to invest if your site has been effectively optimized. Effective SEO incorporates a variety of methods catered to your industry to generate a strong and authoritative online presence such as content marketing, email marketing, deep keyword research and so much more. When an online presence is consistent and appropriately optimized, Google and other search engines are more likely to serve your site to a user who has typed in a query. Sites that aren't effectively optimized lose out on being recognized by search engine bots, or worse, they may be crawled and recognized for something that is completely not related to the product service leaving the user frustrated and you with a higher bounce rate. Google's algorithm continues to be updated in order to weed out any of these issues, and though Google and Rank Brain are highly sophisticated, they are still not human. Ultimately, Google and Bing and other search engines want to keep their authority in being a search provider so they commit to providing the most relevant results per each search query. Optimizing your site regularly maintains a solid and growing online authority and will bring in positive results. Top Marketing Strategies is committed to making sure our clients have a stable and solid local online presence so that their business can thrive, grow and reach a higher conversion rate. Search engines determine the rankings of these results each and every time based on algorithms. This is why good SEO is so imperative. Search engine algorithms factor in a variety of site characteristics in order to determine it's authority on the query's subject. Not only are their many factors within an algorithm that determine your website’s SERP (Search Engine Results Page) rankings, but these factors are constantly being updated and added to. Companies without a constantly evolving SEO strategy are often left on the outside looking in. The lack of an effective SEO strategy sinks a business in the SERP rankings and decreases the website’s visibility to potential customers. Let's face it, the internet is now our dictionary, encyclopedia, Yellow Pages and more. And with mobile devices growing more modern and integrative with everyday life, you not only need to have a responsive web design, but it's imperative to incorporate a good SEO strategy including heavy keyword or topical research for content, reputation management, social media marketing and maybe even some PPC (Pay Per Click). SEO brings in quality leads that are looking for your product or service. Users typically click within the first page of search engine results in order to find what they want. Users are impatient and if they don't find what they're looking for, they'll type in something else. 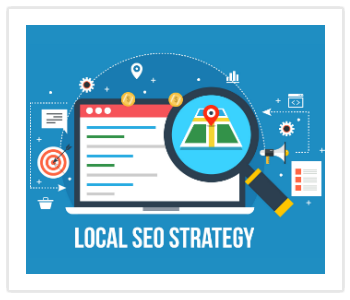 Local SEO is a way of reaching customers who live, work or are visiting the area close to where your business is located. It’s a type of targeted marketing aimed at capturing the here and now of an audience. These people are looking to the search engine to provide results about a physical brick and mortar type location. They want to know for example, where a particular restaurant is, what time the Laundromat closes and when the local coffee shop opens in the morning. Local SEO bridges the gap between the internet and the type of real-world people you are searching for. It uses GPS data to pinpoint your location and produce the most relevant locally based results from wherever you are. The power of local SEO is deployed in a number of ways including the popular business directory-type websites such as Yelp, Foursquare, Google business listing, Superpages and more. Having a presence on these sites is a sure way to have your business highlighted in locally based search results. When someone is seeking out local services that match your keywords or business description. Maintaining a strong online presence on these sites will help shape an identity that people can refer to when searching for your type of business. A smart local SEO strategy for a brick and mortar business is probably the most important aspect of your online presence. People want to know before they go. Most people turn to search engines to find that next place to shop. Allow yourself to be discovered with the help of a strong local SEO strategy. This targeted market approach is critical to your company’s success. International SEO is another marketing strategy for your website that boosts its potential to reach international visitors. When your website is optimized with a smart international SEO plan of action, it allows search engines to easily identify which countries you are trying to reach and whether or not you use different languages to do so in the process. Unlike local SEO, this strategy is geared more for companies who experience a strong online presence from international browsers. 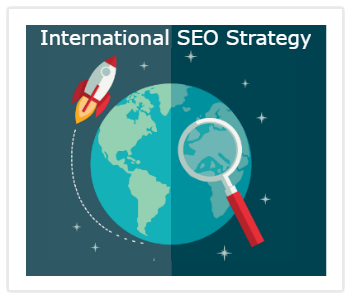 Some companies cater more to international customers and if that’s the case an international SEO strategy is critical to your company’s success. It’s just as important as a local SEO strategy is to a brick and mortar restaurant who’s trying to earn new business from the neighborhood residents. International SEO services can optimize your site making it more user-friendly for visitors. It will help with your search engine rankings as well when you are prepared to bring the content of your website to the people who need it most. In a way, it’s the same concept as local SEO services. Much like those local SEO services, it’s a type of targeted marketing aimed at capturing a particular demographic that are more likely to benefit from the goods and services offered by your website. A strong International SEO strategy will target the specific market and region and make it easier for international customers to find you. It will also utilize language tags to increase visibility as well as offer content in the language the targeted country speaks. When you incorporate these factors into a well developed and implemented international SEO strategy, you will reach a whole new market of potential business. With each update to a search engine’s algorithm, it becomes smarter in sorting through the millions of results it produces. The goal of most major search engines is to provide the user with the most relevant results possible without having to sort through the millions of hits the search itself actually produces. The user trusts the search engine and how it operates. As a result, they will not sort through more than the first few pages of results to get the answers to their inquiry. Search engines determine the rankings of these results each and every time. That’s part of the reason why SEO is so important. It uses the information you have created about your website and compares it to millions of other results to determine if a particular search result is more relevant to the user’s request than the other. There are many factors that determine your website’s overall SERP ranking which indicates a strong need for your SEO strategy to match the high demands of today’s search engines. Companies without a constantly evolving SEO strategy are often left on the outside looking in. The lack of an SEO strategy sinks a business in the SERP rankings and decreases the website’s visibility to potential customers. Search engines are constantly trying to outsmart the SEO strategies that companies develop to compete with their rigid standards. With the level of online competition stronger than ever before, you have to fight for every bit positive of search engine ranking you can get. SEO does this for you. It keeps your company relevant to potential customers and keeps you ahead of the curve without sacrificing the growth of your business to do so. Research has proven that users are most likely to click on the first five search engine results in order to fulfill their request. This space is critical and with a strong SEO strategy, you can be one of those first five in someone’s next Google search.